When Lisa Cannavale (pictured) first came to UB she found that the school didn’t have social media dedicated to showing food options on campus. This led Cannavale to create the Instagram page UB_Hungry, which now has over 300 followers. When Lisa Cannavale first noticed her Facebook newsfeed taken over by food blogs and how-to recipe videos, she got curious. She wondered whether there was a social media source that displayed UB’s wide array of food options. When she realized there wasn’t, Cannavale, a sophomore communication major, decided to start one of her own: an Instagram page named UB_hungry, which displays various photos of food in UB and currently has more than 300 followers. Cannavale said when students are thinking of coming to UB, they often don’t have a chance to see the university’s food options. “If we can bring the food to social media, maybe that would influence some students to start thinking about UB and realize how awesome their dining program is,” Cannavale said. Variation in food type and location is an important piece to the Instagram page, according to Cannavale, as she tries to post meals from different on-campus locations daily. Mary Kilfeather, a sophomore business major who follows Cannavale on Instagram, enjoys the diversity of the posts. “It’s really cool to be able to see all the different options campus dining offers, especially when it shows places I’ve never been to like the Kosher Deli or the Governors Dining Hall,” said Kilfeather. Prior to getting the page started, Cannavale approached Catherine Donnelly, assistant director of Web Services for the Office of Marketing and Communications in Academic Affairs, who said Cannavale’s enthusiasm about UB and the food offered on campus, along with her desire to “encourage students to come to UB,” made her want to help with the Instagram page. “I’ve been very happy to see how often she posts. 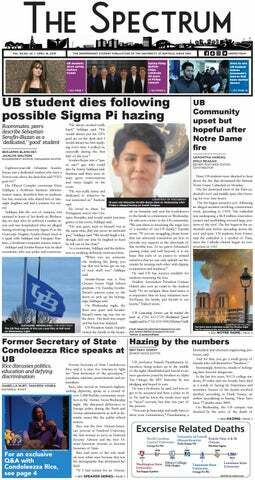 There really is a ton of unique food choices at UB and she is doing a great job to promote that,” Donnelly said in an email. Donnelly also said that the UB_hungry page features food that would appeal to students with various diets, such as vegetarians. Cannavale said she does not receive any compensation from UB for the Instagram page but was granted $50 in dining dollars from UB Campus Dining and Shops (CDS) to hand out to students to promote the page. The students would then participate in five competitions, each worth $10 worth of dining dollars. Raymond Kohl, marketing manager for CDS, helped Cannavale with the contest prizes after UB Admissions contacted him regarding the Instagram account. He was eager to help Cannavale promote her blog. “We think it’s great that students are passionate about food and have such an interest in it. Hopefully the UB_hungry page inspires some more great items here at UB,” Kohl said in an email. In order to win $10 in dining dollars through UB_hungry’s contest, students must send Cannavale a photo of food purchased on campus with a meal plan or dining dollars. She will then choose which two pictures she likes the best before posting them and letting her followers decide the winner based on likes. Cannavale said she typically posts at locations in which food can be bought using a meal plan or dining dollars. This means that for the time being, food from The Commons or local restaurants will not be featured on the UB_hungry page. “Essentially, it’s on-campus food that you would use with a meal swipe, however in the future once I eventually run out of different foods on campus – it’s just inevitable – I’m going to try and do places that accept campus cash,” Cannavale said. The fact that all of the food Cannavale posts can be used with a meal plan is a positive, and unique, aspect to her followers. “Since it’s all on the meal plan you know you don’t have to spend your cash on food unlike other food Instagram accounts I follow,” Kilfeather said. As far as expanding the UB_hungry brand, Cannavale said she is going to stick to Instagram for now. She said unless she gets “an obscene amount of followers in a really short period of time,” she wants to keep it small. Cannavale hopes that more students are encouraged to come to UB by visiting her Instagram page. She plans to continue posting on UB_hungry for the rest of her time at UB, including during the summer. After she graduates, Cannavale is considering passing her blog down to someone with similar interests to continue informing current and prospective students of the food they can purchase on campus. “I love it here, and I’m hoping that with help from current students the blog can become more active, and everyone will be eating happily and healthily at UB,” she said.